MOPS stands for Mothers of Preschoolers, a program designed to nurture mothers with newborns through kindergarten as well as pregnant moms. The women are of many ages and backgrounds, but share the same desire- to be the best mothers they can be. The Evening MOPS group expands their reach to mother's of both Preschool and Elementary age children. What is MOPS at Creekside? MOPS at Creekside provides an inviting environment where women can come-just as they are-to build friendships, be encouraged and gain practical strategies all while their children are lovingly cared for in the MOPS Kids program. A typical meeting starts by sharing a meal together. There is usually a craft project or speaker on a motherhood topic. Discussion groups allow you personal time with a smaller group of moms to share ideas, thoughts and experiences. Also, in attendance each meeting are seasoned moms there to encourage, mentor and give us practical advice based on their experience and wisdom. We close with prayer requests and door prizes. MOPS Kids is a quality children's ministry. Our little ones are loved and nurtured during our MOPS meeting. This program includes classes for infants through pre-k. Children will enjoy stories, games, free play, crafts, music and a healthy snack. You may attend MOPS with or without your children. If you're a mother of a preschooler, you've got your hands full... We know how you feel, and we're here to help! There is nothing little about a mother's impact. The early years of child rearing are so significant and formative-so precious and fleeting... Moms know this, so they pour themselves into mothering. But who pours themselves into moms? We do. MOPS stands for Mothers of Preschoolers, a program designed to nurture mothers with newborns through kindergarten as well as pregnant moms. The women are of many ages and backgrounds, but share the same desire- to be the best mothers they can be. MOPS at Creekside meets from 9:30am until 12:00pm on alternate Fridays during the school year. Each meeting provides an inviting environment where women can come "just as they are” to build friendships, be encouraged, and gain practical strategies all while their children are lovingly cared for in the MOPS Kids program (drop off starts at 9:05). A typical meeting starts by sharing breakfast together. There is usually a craft project or speaker on a motherhood topic. Discussion groups allow you personal time with a smaller group of moms to share ideas, thoughts and experiences. Also, in attendance each meeting are seasoned moms there to encourage, mentor and give us practical advice based on their experience and wisdom. We close with prayer requests and door prizes. MOPS Kids is a quality children's ministry. Our little ones are loved and nurtured during our MOPS meeting. This program includes classes for infants through Pre-K (4 year old preschool). Children will enjoy stories, games, free play, crafts, music and a healthy snack. You may attend MOPS with, or without your children. How do I join MOPS? Mothers of all denominations, as well as, mothers who do not attend church are welcome. Participation in a MOPS group requires membership in MOPS International. For only $31.95 a year, a mom can register for membership and receive a one-year subscription to MOMSense magazine, weekly MOM-Email messages and many other great benefits. MOPS dues are $95 for the year with childcare or $65 if not childcare is necessary. Dues can be paid in full for the year, or split the fee to be paid at the beginning of each semester. These fees help cover ministry costs, childcare costs, the MOPS Kids program, crafts, speaker gifts, decorations, etc. An RSVP is required for moms who will be bringing their children to MOPS Kids. To RSVP, please email . We hope to see you there! The goal of Evening MOPS is to bring some of the key fundamentals of MOPS; spiritual hope, personal growth and mothering support to working mothers or those that are unable to attend the morning MOPS program. Moms of preschoolers and elementary school aged children are welcome. A Mothers of Preschoolers (MOPS) group is a dynamic, inviting environment where women can come to build friendships, be encouraged by each other and gain practical parenting strategies. Moms get together to share food, for fellowship, and to hear inspiring speakers. While mothers are in the MOPS meeting, children are lovingly cared for in the MOPS Kids program. Meetings are from 5:00-7:00pm in room 140. HOW DO I GET ON THE LIST FOR EVENING MOPS OR FIND OUT MORE? Are you a mom age 21 or younger looking for a place to fit in? Teen MOPS is for you! If you are a young mom who is pregnant or has a child, it's time to join Teen MOPS! There is no cost, dinner is served and childcare is provided! What happens at Teen MOPS? Teen MOPS provides a loving, nurturing, and understanding environment for you to come together with other young moms and have fun and share your joys, fears, and frustrations while your child is being well cared for. The group meets weekly so that you can see your friends and stay connected with other members of the group. Come on time, bring a friend, participate in the meeting and earn points for free stuff for you and your child. Make connections and find support with other teen moms. Fun, food and creative activities for you, while you child enjoys fun and love just down the hall. Cool crafts every month. Make fun and useful items for you, your home, and your child. Resources and speakers that will help you become a better mom. Teen MOPS meets on Sunday evenings, twice per month, from 5-7 at Creekside UMC, in the Discipleship Wing. For more information, contact Christy at . Every year MOPS sponsors a Spring and Fall Consignment Sale. This is a wonderful opportunity to shop for gently used (and even some new) children’s and maternity items such as quality clothing, toys, games, nursery equipment, and so much more. Proceeds from the sale will benefit the MOPS and Teen MOPS ministries. The goal of MOPS is to "encourage, equip, and develop every mother of preschoolers as a woman, mother, leader in the name of Jesus Christ." 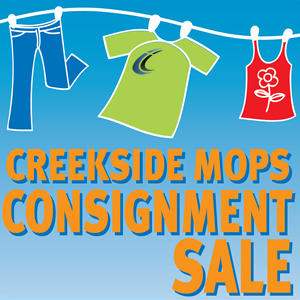 Consign, Volunteer, or Shop to support these growing ministries here at Creekside! The Holiday Showcase and Creekside Holiday Cafe are a tradition at Creekside. For two days, a Friday and Saturday in early November of each year, our church campus becomes a place for families from the community to gather to enjoy fellowship, fun, shopping, and dining. The first Holiday Showcase began as a way to help support home base business owners who were members of the MOPS (Mothers of Preschoolers) ministry. Since then, the event has become the main fundraiser to support the MOPS ministry's financial needs. Each year you will enjoy unique Christmas shopping - with 50+ vendors providing gift and home decor items. Each year there is something new and special to enjoy. We invite you to join us!